100% Glass material, which is Dishwasher safe. So What Are You Waiting For? Order Your Own Godparents Gift set - While Supplies Last! 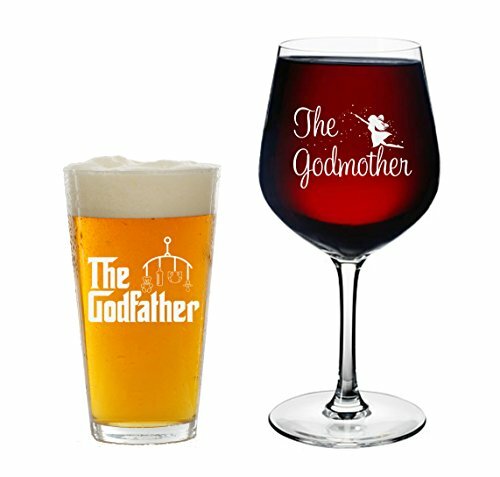 WILL YOU BE MY GODPARENTS - The wine glass makes a perfect gift for every wine loving Godmother and the beer pint glass fits perfectly in the hand of the elected godfather. THE GIFT THAT KEEPS ON GIVING - What's better than giving a wine glass for a wino or wine lover. Every time they drink their precious wine they will think of you. TOP QUALITY - Made in the USA with the highest quality materials that can guarantee its long life and their constant satisfaction. This glassware gift will ensure an enjoyable evening dinner for many years! CAREFULLY PACKAGED - Each Godparent gift set is carefully packaged in a durable box; guaranteed to arrive safely with free shipping through Amazon Prime.